What could you expect from tiger lily bulbs? Charm of a wild cat and exotic colours are the main assets of those spectacular flowers. Enjoy their bright colours and imagine, how splendid would they look in your garden. 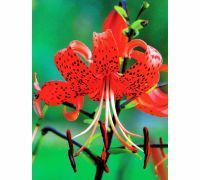 No one could resist the charm of the Turk’s-cap-shaped, dotted blooms of the lily varieties that are available in our store. Just take a look at the pictures! 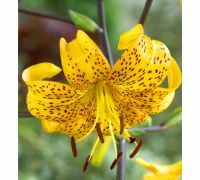 You will find all the most intriguing tiger lily varieties in our offer. We particularly recommend bulbs of the captivating bright orange „Tigrinum” lily that will look great paired with the sunny „Yellow Tiger” variety. 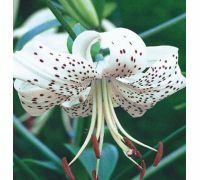 If you would like to bring some harmony to the border or lawn grouping, pick the „White Tiger” lily bulbs. And what if you prefer warm, deep shades of the red and dark pink tiger lilies? Every decision you would make, is the right one, as all our plants come from renowned producers with a proven track record, who enjoy well deserved reputation. We kindly invite you to our online garden store and to check out our prices. 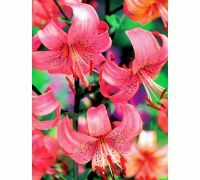 The wide selection of tiger lily bulbs originating straight from the Netherlands is available now – click the names, make an order, wait for the delivery and start arranging the border of your dreams.